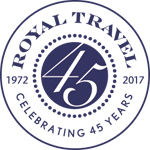 Ben joined Royal Travel in 2017 as Managing Director focused on growing Royal's footprint in the New York market. Prior to joining Royal Travel, Ben enjoyed a 15 year career in commercial real estate as both a commercial broker with Grubb & Ellis in Washington, DC and as a shopping center developer with Kane Realty Corporation in North Carolina. While attending Harvard and obtaining his undergraduate degree in Government, Ben worked for both Omni and Starwood Hotels. Ben resides in New York and is the father of two daughters. My mother and my grandparents were lucky enough to be stationed in Honolulu during the Korean war and as such the islands of Hawaii have always been extremely special to my family. I will never forget my daughters' first trip with my family to Hawaii and watching them fall in love with the islands just like the rest of us. London all the way. It was my first trip abroad and I cried the whole flight home. I was so depressed when I got back that my parents booked a return trip within a week of returning. I go back several times a year and never grow tired of the city. The history, the hotels, the culture...I even love and crave English food. I love to learn and there is no school or course that can replicate what you learn when traveling.